NASA's Spitzer Space Telescope set its infrared eyes upon the dusty remains of shredded asteroids around several dead stars. This artist's concept illustrates one such dead star, or "white dwarf," surrounded by the bits and pieces of a disintegrating asteroid. At least onein every 100 white dwarf stars may be orbited by asteroids and rocky planets, newobservations from NASA's Spitzer Space Telescope suggest. The finding couldmean that these now dead stars once hosted solar systems similar to our own. Also, thework could help scientists determine whether other rocky,Earth-like planets are orbiting around other stars. White dwarfstars are the compact, hot remnants left behind when stars like our own sunreach the end of their lives. As amiddleweight star like our sun ages, it eventually swells into a red giantphase. Stars of this mass aren't heavy enough to end their lives in thespectacular explosions known as supernovas; instead, they gradually expel theiratmospheres until they shrivel into the hot, dense dead stars called white dwarfs. Theatmospheres of whitedwarfs usually consist entirely of hydrogen and helium, but sometimesheavier elements such as calcium or magnesium are detected contaminating thestellar material. Data fromSpitzer suggest that at least 1 to 3 percent of white dwarf stars arecontaminated in this way. Scientiststhink that the out-of-place elements come from a gradual rain of orbiting dustonto the sun. The dust emits infrared radiation which Spitzerdetects. The dust isentirely contained within what is called the Roche limit of the star, or closeenough that any object larger than a few kilometers would be ripped apart bygravitational tides. (This is the same phenomenon that produced Saturn's rings. 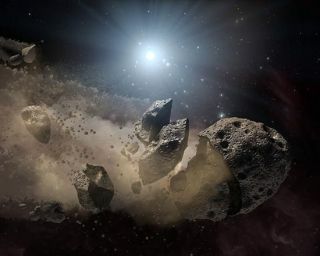 )Because of the location of the dust, scientists think that the dust mayoriginate from rocky bodies such as asteroids (also known as minor planets)that were torn apart in this way. This couldmean that as many as 5 million white dwarfs in our own Milky Way are surroundedby orbiting asteroids. For theasteroids to get within the Roche limit to be pulled apart at the seams, theymust be perturbed from an orbit farther out from their star ? the asteroidscould be nudged by as yet unseenplanets. Because thewhite dwarfs descend from main sequence stars like the sun, the team's work,presented at the European Week of Astronomy and Space Science conference in England, implies that at least 1 to 3 percent of main sequence stars have terrestrialplanets around them. "Inthe quest for Earth-like planets, we have now identified numerous systems whichare excellent candidates to harbor them," said study team member Jay Farihiof the University of Leicester in England. "Where they persist as whitedwarfs, any terrestrial planets will not be habitable, but may have been siteswhere life developed during a previous epoch." Thecomposition of the crushed asteroids can be measured by detecting the heavyelements present in white dwarfs, so scientists hope to learn more about thesolar systems that may once have circled around the star. "Withhigh quality optical and ultraviolet observations (for example, the Hubble SpaceTelescope), we should be able to measure up to two dozen different elements indebris-polluted white dwarfs," Farihi said. "We can then address thequestion, "Are there rocky extrasolar planets we find similar to theterrestrial planets of our own solar system?" The huntfor other Earth-like worlds is the primary mission of the Kepler spacecraft,which recently sentback its first images.